While district heating systems may have had something of a chequered history in the UK, the last few years have seen a considerable resurgence in their popularity. This is in line with the move to central energy centres, which make it easier to deploy both traditional and low carbon heat sources together. As a result, district heating, or heat networks as they’re also known, are set to play a key role in the UK’s carbon reduction strategy. The UK government is making funding available to help local authorities explore the feasibility of district heating systems. Nevertheless, there have been concerns regarding the overall efficiency of district heating/heat networks. When the situation is examined carefully, however, it is clear that where such systems have delivered disappointing performance this has usually been the result of non-optimal system design. The key point here is that achieving optimum efficiency requires a whole system approach. Specifying plant that is inherently efficient is certainly one part of the equation, but the rest of the system needs to be designed to exploit that inherent efficiency. In the majority of cases this will also involve integrating different heating technologies and ensuring they work in harmony. Beyond the plant room, as is made clear in the CIBSE/ADE Heat Networks Code of Practice, the management of hot water flow rates and flow and return temperatures is also critical. The majority of district heating systems that are currently being installed are serving single, multi-occupancy buildings or relatively small groups of buildings from a central plant room. Many of these are taking advantage of the availability of smaller combined heat and power (CHP) plant to generate both heat and electricity. Often, the CHP is backed up by other heat sources that can include heat pumps, solar thermal, biomass boilers, or gas or oil-fired boilers. Heat interface units (HIUs) are generally used to control and meter space heating and domestic hot water in individual multi-occupancy buildings with an HIU installed in each space. This is relatively straightforward as the temperatures and pressures will be consistent throughout the building, and well-designed HIUs are able to adjust to variable demand from different spaces. However, some heat networks supply a number of different buildings, each of which may have different temperature and pressure requirements – especially if they are different types of building. Indeed, a diversity of building types is often favoured as mixed demand patterns spread heat loads more evenly. In such cases, each building needs to be fitted with a sub-station that is capable of converting the hot water temperatures and pressures provided by the energy centre to the operating conditions required by the building. Each sub-station will typically comprise a plate heat exchanger, pumps and heat meters – ideally in a compact packaged configuration to minimise plant room space requirements. In the energy centre itself it is essential that the various types of heating plant are controlled to take advantage of the performance characteristics of each. For example, the CHP unit could be sized on its thermal output to achieve a constant base load throughout the year, with the power generated being used onsite, exported to the grid or both. Surplus heat in the summer can be used to drive an absorption chiller to generate chilled water for air conditioning. In addition to this relatively constant load, there will be considerable heat load variation through the day, the seasons and the lifecycle of the building, and the system needs to respond to these changing heat loads efficiently. A key element of this is to back up the CHP with a responsive heat source, such as fully modulating gas-fired condensing boilers. 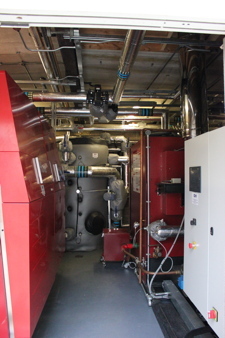 For even greater flexibility and efficiency at variable loads, gas-fired boilers are increasingly being installed as cascade systems, using several relatively small boilers rather than one or two large ones. 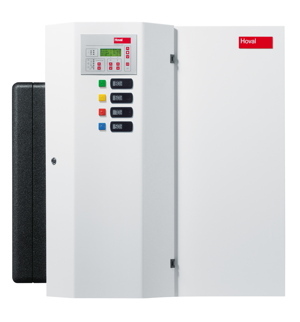 This enables the system to respond very efficiently to changing heat loads. If the energy centre is also producing domestic hot water (DHW) then minimum storage high output calorifiers or plate heat exchangers feeding into stainless steel buffer vessels should be considered. This arrangement provides an opportunity to include solar thermal heating or heat pumps in the mix, using them to pre-heat the cold mains water. One of the other heat sources would then be used to bring the water up to the required temperature. Clearly, with such a diverse mix of heat sources the controls will play a major role in preventing conflicts between the different types of plant. It is therefore important to specify controls that are capable of managing single or multiple conventional and low carbon heat sources, with functionality such as real-time monitoring and visualisation. Simply tweaking traditional controller designs to try to address these issues has only been partially successful. The optimum solution is to take advantage of new designs of controller that have been reengineered from the ground up, that have the capability to control a range of heat sources. Such controls should also be able to extend the cascade principle to different heat sources. With a multi-source energy centre, it is essential to ensure all of the systems work together and that hot water temperatures and pressures are properly controlled at each building. A holistic approach to system design and use of compatible components is the way to deliver the best solution for the end client.